A reader recently wrote in and asked if I could make an attempt at a copycat Orange Julius Recipe that was Weight Watchers friendly. Well, when I was younger, I used to get an Orange Julius almost every time I went to the mall, and her email got me feeling all nostalgic. Do Orange Julius locations even still exist? I have no idea. But their signature, original Orange Julius was so amazingly delicious…it tastes like a melted orange creamsicle – YUM. Though it’s been years since I’ve had one, I will never forget the deliciousness of an Orange Julius. 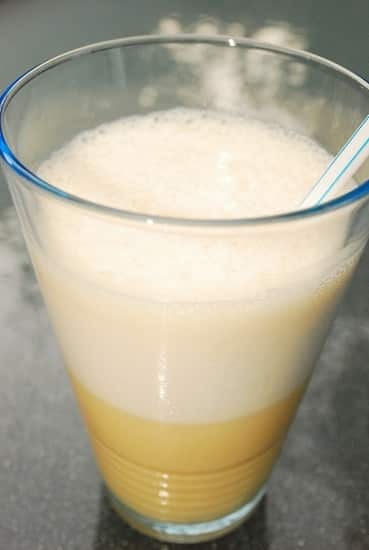 So with some fresh oranges on hand, I decided to take a stab at creating a low calorie Orange Julius Recipe that tastes just as good as the real thing, but lower in Weight Watchers Points. I was thrilled at how yummy it turned out! Whether you’ve ever had an Orange Julius or not, this smoothie recipe makes an ideal summer drink recipe that will have everyone’s taste buds going crazy. This is a perfect, copycat Orange Julius Recipe that has the same fantastic taste, but boasts just 4 Points per serving. It’s a fabulous summer drink recipe that is a much healthier version than the traditional Orange Julius. I do know that they used a malt p[owder in them. I made up my own orange julius recipe before I saw this one, and I think it might be only 3 points, but I could be mistaken. I peel two large oranges and throw them in the blender as is with 1/3 cup skim milk, 8 to 12 ice cubes, some vanilla and 1 rounded tablespoon of Jello fat free vanilla pudding which thickens it up nicely. Too much pudding ruins it. It really fills me up and is quite satisfying if I am craving something cold and delicious! I can’t wait to try this. My step-mother would always get them when we went to the mall and we would beg to have some. And yes, Orange Julius still exists. I just made more today….SOOOOOOOO GOOD!!! A friend of mine made it with the frozen orange juice concentrate and it wasn’t as good as making it with the fresh squeezed oranges. Thank YOU! My mom would make this for a special treat for us when we were kids. If we had friends stay overnight it would be a must and they would think my mom was the coolest! I had forgot about it until now. I have never had one out so don’t even know what they are supposed to taste like but they were delish. If my memory serves me this is really close to her recipe only she used frozen OJ and made it by the pitchers! Can’t wait to try it! Thanks again for bringing back such fond memories!